Minimum order: one case, (48) sets of our regular Washable Produce Bag, each made from super strong 100% Nylon to carry the bulkiest of items. The rip-proof nylon mesh lets customers wash produce right in the bag and serves as a scrubby to wash away contaminates. 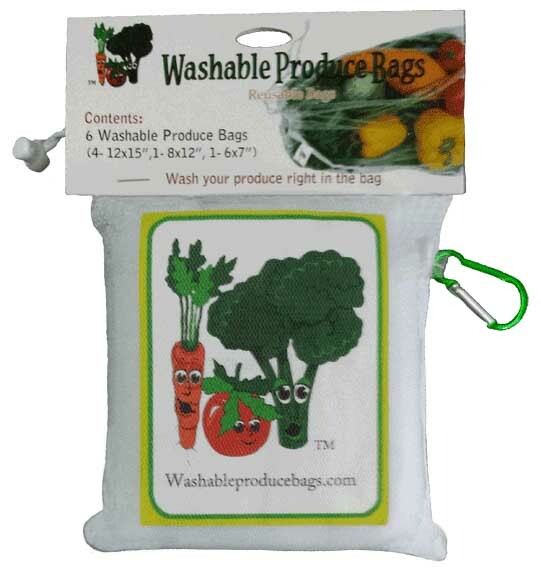 Each set contains a carabiner, and (4) 12”x15”, (1) 8”x12″ and (1) 6″X7″ reusable washable produce bags. Contains 48 Sets of “It’s Your Bag” individually wrapped produce bags. Minimum order: One Case. Bags are made from super strong 100% Nylon to carry the bulkiest of items. 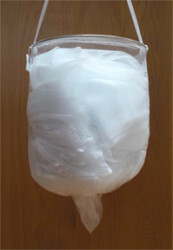 The rip-proof nylon mesh lets customers wash produce right in the bag and serves as a scrubby to wash away contaminates. 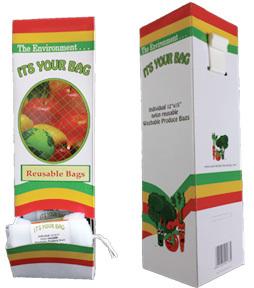 Each set contains a carabiner, and (4) 12”x15”, (1) 8”x12″ and (1) 6″X7″ reusable washable produce bags. Each case includes (8) Dispensers which hold up to (30) individually wrapped produce bags. Dispensers can be displayed stand-alone, or use the included plastic clip to attach to shelves. Usually for retail environments or big kitchens, the Basket of Bags provides maximum visibility and accessibility. With 50 reusable Washable Produce Bags, your bag-shortage worries are over. Let your shoppers or kitchen staff have convenient access to this versatile and sturdy 100% nylon bag that carries and stores all sorts of produce. They will love the convenience of washing produce right in the bag, and since they don’t retain moisture, simply shake off and reuse. The washable produce bags have turned out to be a great item for our store. We were originally sent one box of the washable produce bags several weeks ago. We sold out of the bags within three to four days. It was really great to see the bags fly out of our store sosoon. 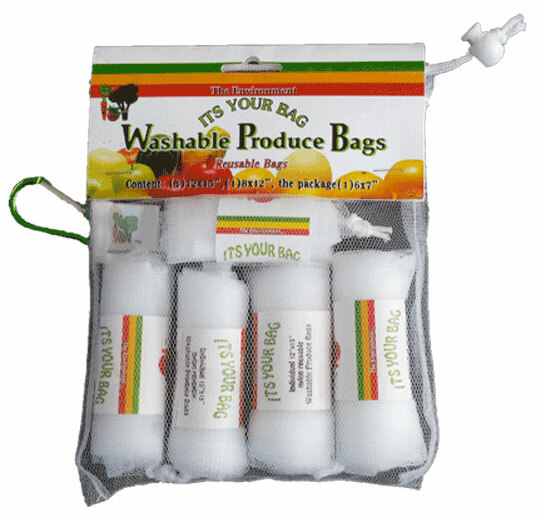 We look forward to continue sales with the washable produce bags.